Functional groups are groups of atoms found within molecules that are involved in the chemical reactions characteristic of those molecules. Functional groups can pertain to any molecules, but you will usually hear about them in the context of organic chemistry. The symbol R and R' refer to an attached hydrogen or hydrocarbon side chain or sometimes to any group of atoms. An acyl group is a functional group with formula RCO- where R is bound to the carbon atom with a single bond. An acyl halide is a functional group with formula R-COX where X is a halogen atom. The formula for the azide functional group is RN3. The formula for the azo or diimide functional group is RN2R'. The molecular formula for the butyl functional group is R-C4H9. The formula for a carboxamide group is RCONR2. The molecular formula for the decyl functional group is R-C10H21. The molecular formula for the ethyl functional group is C2H5. The molecular formula for the heptyl functional group is R-C7H15. The molecular formula for the hexyl functional group is R-C6H13. The hydrazone functional group has the formula R1R2C=NNH2. Ketone is a carbonyl group bonded to two carbon atoms where neither R1 nor R2 can be hydrogen atoms. The methoxy group is the simplest alkoxy group. The methoxy group is commonly abbreviated -OMe in reactions. The general formula for a nitrate is RONO2. The formula of the nitro functional group is RNO2. The molecular formula for the nonyl functional group is R-C9H19. 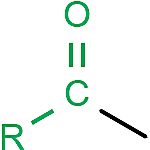 The molecular formula for the octyl functional group is R-C8H17. The molecular formula for pentyl functional group is R-C5H11. The formula for the phosphate functional group is ROP(=O)(OH)2. The formula for a phosphine is R3P. The formula for the phosphodiester group is HOPO(OR)2. The formula for the phosphonic acid functional group is RP(=O)(OH)2. The formula for a primary amine is RNH2. The molecular formula for the propyl functional group is R-C3H7. The formula for the pyridyl group is RC5H4N. The location of the nitrogen in the ring varies. The formula for the quaternary ammonium cation is R4N+. The formula for a secondary amine is R2NH. The formula for the sulfone functional group is RSO2R'. The formula for the sulfonic acid functional group is RSO3H. The formula for a tertiary amine is R3N. The molecular formula for the vinyl functional group is C2H3. It is also known as the ethenyl functional group.